Checking EPF balance was a project once upon a time. You need to wait till EPF printed statement is given by your employer. However, in last few years, we have seen a drastic improvement in EPFO (Employees Provident Fund Organization). Starting from downloading EPF UAN Passbook to EPF balance withdrawal everything is online. Few month back EPF UAN Passbook Download facility was launched by EPFO. The facility of downloading EPF UAN Passbook is recently modified. A New interface is launched with improved speed. The revised procedure, to download your EPF passbook, is given below. 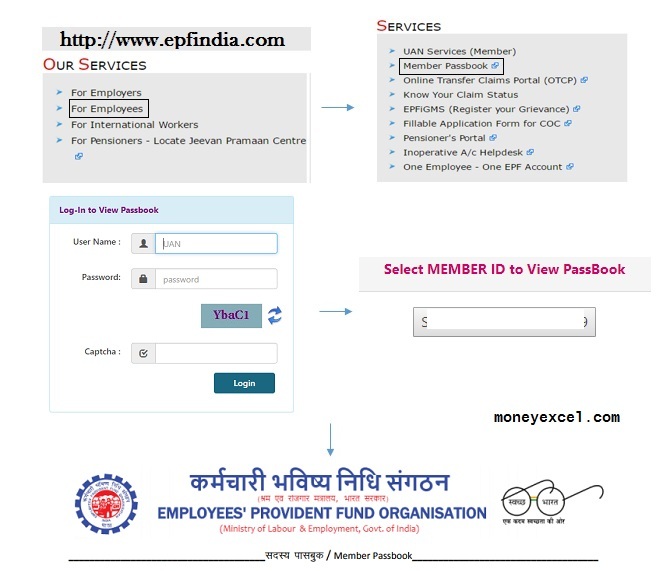 Click on Member Passbook it will open authentication tab for viewing and downloading EPF passbook. Enter your UAN User ID, password, and Captcha. Once done click on Login Button. On successful login, you will able to see Member ID button. Click on the button and you will able to see your UAN passbook on the right-hand side tab. All passbook entries displayed are reconciled with EPFO office. This facility is available for the members registered on the Unified Member Portal. If you are not registered user you need to visit https://unifiedportal-mem.epfindia.gov.in/memberinterface/ to activate your UAN. For new subscriber passbook download facility will be available after 6 hours of registration at Unified Member Portal. Similarly, any change in credential at Unified Member Portal will be effective to the new portal after 6 hours. The passbook download facility is not extended for the Exempted Establishments Members / Settled Members / Inoperative Members. If you are unable to login into above facility or if you have any other query related to EPF passbook you can get in touch with the helpdesk. The contact number of the helpdesk is 18001-18005 (Toll-Free). Helpdesk will remain operational from 9:15 AM to 5:45 PM. Read – How to link Aadhaar to EPF Online on UAN Portal? The change done in this facility is very nominal in terms of speed and user interface only.